In an age of easy communication it can be surprisingly difficult to organise catching up with geographically disparate friends. Even those who work with the cutting edge of technology. A fair bit of last minute to-ing and fro-ing saw us loitering outside a supermarket in Otley, waiting for my mate who had suggested the Fleece for lunch. The food and beer were both supposed to be excellent. On a Monday lunch time the Fleece was almost empty: hopefully this means that many of the good folk of Otley are gainfully employed. As far as I’m concerned, a generous choice of tables in a pub is always a good thing. The Fleece is operated by WharfeBank Brewery so in addition to a small selection of real ales from other small brewers, three of WharfeBank’s own beers took pride of place on the bar. I tried a pint of WharfeBank’s CamFell. The menu is a good size list of smartened up pub classics. 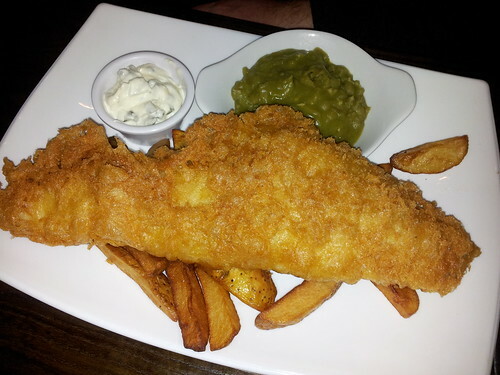 Andy chose fish and chips (Steve commented that the piece of fish looked like it had come from a whale), Steve chose the burger (with cheese but no bacon) and I opted for the crispy pork belly with black pudding mash. The mains all hover around the £8-10 mark so this was by no means the cheapest pub meal you’ll find in the north of England, but it was very good. My pork belly (the only thing I managed to taste!) was tender and moist, its piece of crackling was crisp and, perhaps most importantly, it got the seal of approval from the toddler. The black pudding mash also got a thumbs up – there was plenty of black pudding and the chunks were all different sizes. My one criticism would be the gravy which was a bit thick and, um, commercial tasting. Service wise, the barman we dealt with was super friendly and helpful. He was chatty and efficient and, from what I saw, a real asset to the pub. As with pretty much everywhere in the UK (it seems! 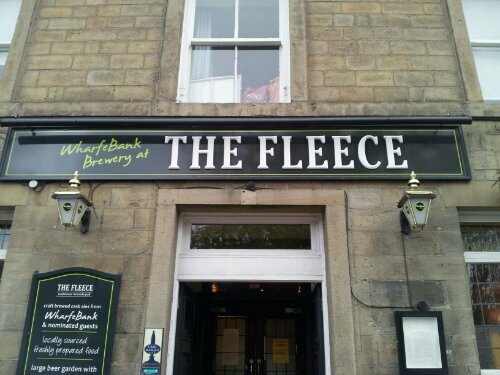 ), the Fleece offers patrons free wifi – just ask at the bar for the password! A big tick all round and definitely a pub worth making a trip to Otley for if you live nearby.